It has been a while since I did nail art. Last Saturday, I did a floral nail art for the girl who won the lucky draw in the Butterfly project. This is the nail art design. She chose pastel color. So I used Sally Hansen's nail color for her. 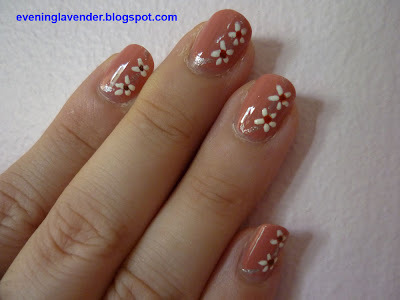 Do u like this simple nail art? If you would like to see more designs, pls click here. Thanks everyone for liking this simple floral design. It's my favourite too! very nice and very easy to apply .post some more.